The following are two short news articles from Fr. David Haines about the happenings in India. 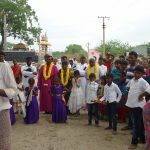 St. Francis Anglican Church, Arakatavemula, Kadapa District, Andhra Pradesh, in south India recently celebrated the tenth anniversary of its founding. The rector of the church is the Rev. Chandra Shekar. Several of the Anglican clergy from nearby congregations, including Bishop Jaya Rao and his wife Rebecca were in attendance for the celebrations. 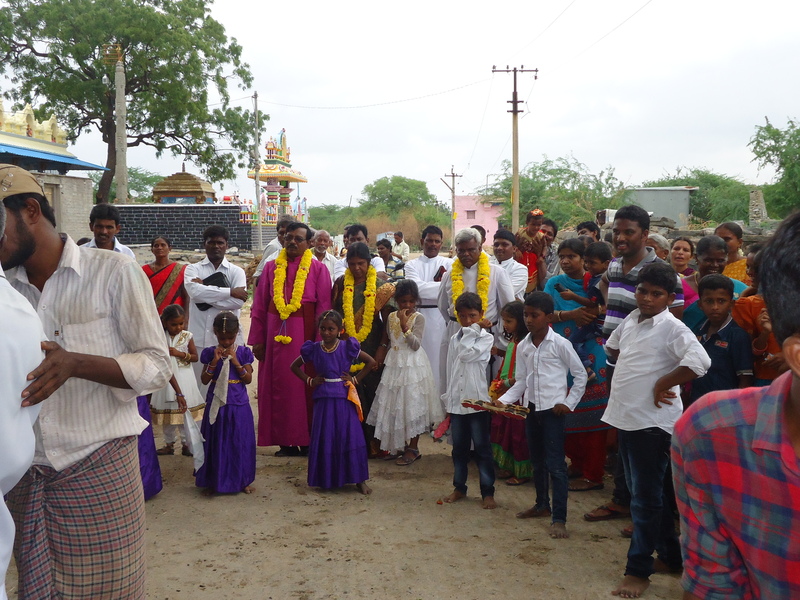 The guests were greeted in the traditional way with wreaths of flowers placed around their necks and they then processed to the church led by the village band and child dancers and performers. The Bishop then celebrated and preached at the Holy Communion that followed and the church hosted a celebratory meal for all in attendance following the service. 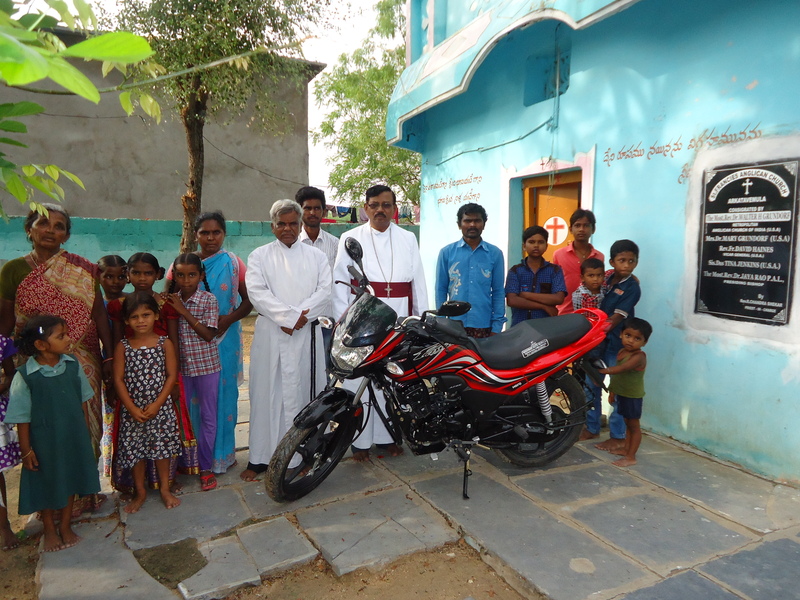 During his visit, Bishop Jaya Rao also blessed a new motorcycle and presented it to Fr. Shekar. The motorcycle was recently purchased with funds that were collected and donated by All Saints Anglican Church, Charlottesville, VA. This brings to six the total number of motorcycles that have been purchased for India. 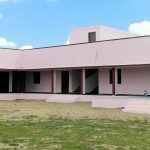 Five years after funds were raised to build a school in a joint project with OM-India, the APA has been allocated a Good Shepherd School. The school is located in Kollur in the Mahbubnagar District which is part of the newly formed state of Telangana. The school is part of a larger rural development initiative among women and children at risk in this region. The initiative is directed most specifically towards temple prostitutes (Joginis) and their children and its purpose is to break the cycle of human trafficking that is prevalent in this area. The school has already been constructed and currently has three grade levels. Our funds will be used to expand the school and to complete the second phase of building necessary to house students through the sixth grade. The only drawback is that the location of the school provides no immediate benefit to any of the children in our existing churches as there is no APA affiliated church nearby. 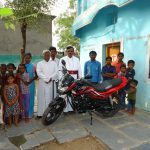 It is hoped that Bishop Jaya Rao will be able to establish a church in the area so that those children may at least benefit from the school.